There has always been a debate whether it is safe or not to let toddlers play trampoline. As they are delicate and can be vulnerable to accidents, it is perfectly normal for parents to worry about their safety, especially when they are playing. But when it comes to trampolining, it isn’t just all about the unlimited fun! If you let your kids wallow in bouncing and jumping on trampolines, a ton of benefits bursts forth that will embed a positive impact on their physical and mental health in the long run. 1. It enhances the flexibility. As your kid bounces and jumps on the trampoline, it gives the bones a good stretch and therefore, enhances flexibility. As the flexibility improves, so blood circulation does. Healthy blood flow goes through the muscles which help diminish tension and stiffness. 2. It is a form of exercise. Toddlers do not usually engage in a formal exercise routine like what most adults do. All they know is to bask in the morning sun and play! But that’s the best part about trampolines. Your little one gets to play without knowing he is also getting the benefits of exercising. As most kids nowadays don’t participate in a lot of activities due to the influence and distraction of gadgets and other devices, they do not have much time to go out, play and interact with other kids. But letting your toddler play on exercise trampolines helps him stay active and physically fit. 3. It develops the child’s ability to learn. Trampolining channels out the toddler’s ability to learn and explore. Although it may not seem like a building block to a progressive learning, it actually is. Your child learns to take charge of his body and how to coordinate with his movements and motions. It also boosts the presence of mind that encourages your little one to control his body movements properly like when and how to get up or how to accomplish perfect landings. 4. It strengthens the density of bones. While bouncing permits the body to move freely, it also trains almost every muscle to unleash its utmost potential. As mentioned beforehand, playing trampoline enhances flexibility where the bones and muscles are constantly flexed. Hence, trampolining strengthens the muscles and the density of bones. Moreover, stronger bones and muscles can reduce the risk of injury. It also promotes better posture. 5. It encourages the vestibular system to function at its fullest potential. The vestibular system refers to the framework that sends signals to the brain and other interconnected nerve pathways to control the balance and movement of the body. As the toddler bounces and jumps on the trampoline, the vestibular system functions at its fullest potential which can highly contribute to the child’s mental and physical growth. The productive function of the vestibular system also becomes an integral part of the body’s activities, allowing each and every input, sensory motion and movement to coordinate with each other perfectly. This function plays a vital role in the child’s cumulative development. 6. It becomes a source of fun! Apart from all these stunning health benefits, what else can trampolining offer? It is one of the best recreational activities that give your toddler a great time to enjoy and have fun! A lot of parents have bad impressions about playing trampolines thinking it could cause more harm than good. Although issues and concerns regarding this activity emerge, it paves a way to instill progressive development in physical and mental aspects in toddlers. However, it is definitely a must to provide safety protocols before letting your children play. Inevitably, every fun activity or game can cause potential risks if precautionary measures are not applied. Safety first! If you want your toddlers to benefit from playing trampolines, here are some ways to keep them safe and protected while indulging in every jump and bounce! Opt for trampolines with safety enclosure. 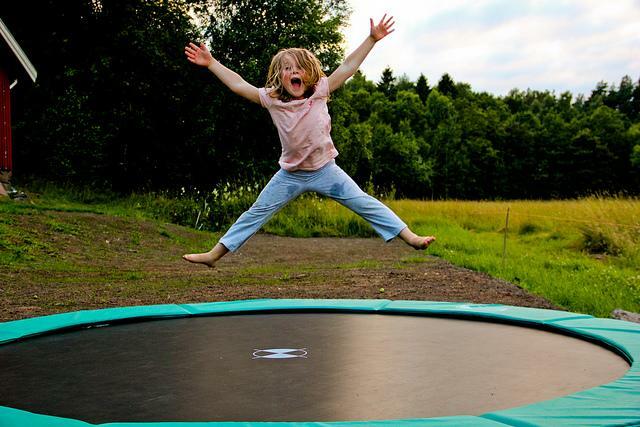 Trampolines for kids are mostly available with safety net enclosure. It adds protection to your toddlers while they are playing. If you are going to put up your own trampoline at home, install a safety enclosure. As the enclosure surrounds the sides of the trampoline, it keeps the toddlers off the ground and less likely to fall and hurt themselves. 1. Don’t leave your children unsupervised. When you let your children play trampoline outdoors, never ever leave them unsupervised. Always make sure that you or a guardian keep on the watch while they are playing. Do not let them move with risky maneuvers or somersaults as these can result in injuries or fractures. When they are done with trampolines, take the ladder off to restrict their access whenever there is no one around to supervise them. 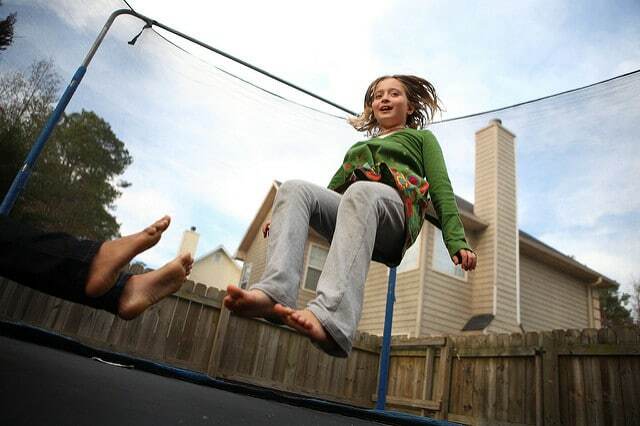 Install protective pads on the parts of the trampolines where injuries can possibly occur. Cover the springs, frames, and other concrete parts to keep your toddlers fully protected from head bumps and bad landings. 3. Regularly check the trampoline for damages. Every now and then, check your trampoline for damages, tears, and broken parts. If ever you found any issues, have them repaired immediately. But if there are some signs of deterioration where repairs do not seem to be possible anymore, it must be the right time to replace it with a new one. Keeping the old one can actually cost a lot in the long run due to unnecessary repairs and part replacements. They won’t be as sturdy as they were before. Do not let your toddlers play with a damaged trampoline. Otherwise, they will end up with injuries and accidents. 4. Put up a trampoline in a safe location. If you are going to purchase your own trampoline for home use, make sure to set it up in a safe location that is distant from trees and other potential dangers. A yard or a field that is close by would be ideal so you can always supervise them when they go for a quick bounce. It is also much safer to put up a trampoline that is at a ground level to deter injuries and accidents that usually take place on higher surfaces. 5. One person at a time. As much as possible, let your toddlers play one at a time. When there is too much crowd bouncing altogether or the trampoline seems too small for them, their movements and balance become limited which can cause bad landings and injuries. If you are still worried about letting your toddlers play trampoline, try to focus on what it can actually do; the health benefits that your toddlers can take advantage of and the positive effects of trampolining on their development in the long run. Even if you let them run across the field or play hide and seek around the house can also impose potential risks and injuries. But, as a parent, you can always keep them safe and protected in everything they do, especially when they engage in physical and recreational activities like trampolining. Let them play and have fun!